Forbes revealed its annual list of the highest-paid musicians of the year and legendary rockers AC/DC landed at No. 7, having made $67.5 million in 2016. Pop singer Taylor Swift topped the list with a whopping $170 million, followed by ONE DIRECTION at No. 2 with $110 million and Adele at No. 3 with $80.5 million. Madonna came in at No. 4 with $76.5 million and Rihanna landed at No. 5 with $75 million. It was reported in December 2015 that AC/DC had sold the most tickets last year. The rockers sold 2.31 million tickets to beat Swift's total of 2.27 million. AC/DC did benefit from performing 15 more shows than Swift. AC/DC also held down the No. 2 position when it came to gross sales with $180 million. 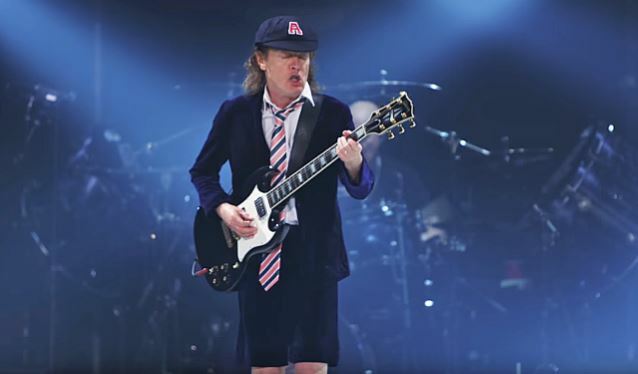 Guitarist Angus Young told The Pulse Of Radio a while back that AC/DC has never changed its approach to its live shows even as it's played bigger and bigger venues. "Somebody once had said, 'You know, people know what they like and like what they know,'" he said. "In the beginning, we were a, you know, just a rock 'n' roll band, and, you know, when you would play in bars and clubs and stuff, you know, this is what the audience was coming to hear you for." AC/DC played what was believed to be the band's last-ever concert with bassist Cliff Williams on September 20 at the Wells Fargo Center in Philadelphia, Pennsylvania. Williams's decision to bow out of the group followed a string of personnel changes for the band that started with co-founding guitarist Malcolm Young's departure in 2014 after he was diagnosed with dementia. Last year, drummer Phil Rudd was sentenced to house arrest after he was found guilty on a drug charge, while earlier this year singer Brian Johnson was forced to step down or face the loss of his hearing. Assuming neither Rudd nor Johnson return, Williams's exit means that only Angus remains from the lineups that recorded classic albums like 1979's "Highway To Hell" — the last album recorded with late lead singer Bon Scott — 1980's "Back In Black" and 1981's "For Those About To Rock...We Salute You". The Philadelphia concert was the last of ten North American dates that were rescheduled after Brian Johnson had to leave the tour. As with the band's European shows earlier in the summer, the vocals were handled by GUNS N' ROSES lead singer Axl Rose. The band does not have any more shows on its itinerary at the moment and Angus Young has not indicated for certain whether the band will continue on.